Assay development for detection of biological targets presents many challenges. To study a target present at very low concentration, antibodies must be of sufficient affinity for accurate and specific detection. For immunogenicity testing, the challenge may be to incorporate several antibodies with a range of binding strengths as a control to mimic primary immune response. Whether you know the optimum binding strength required to perfect your assay, or you need to test a wide range, being able to select antibodies based on their binding strength facilitates your assay optimization, saves time and ultimately improves the outcome of your assay. Generation of custom monoclonal antibodies using the HuCAL® technology enables antibody selection based upon binding strength. Due to this recombinant technology and the ease with which we can make monovalent Fabs, our standard antibody generation process can be extended to include a monovalent koff-rate determination as a secondary screening step, without significantly affecting the speed of the process. The result is a set of unique monoclonal antibodies ranked according to their kinetic koff -rates, allowing for selection of those most suited to your individual assay requirements. 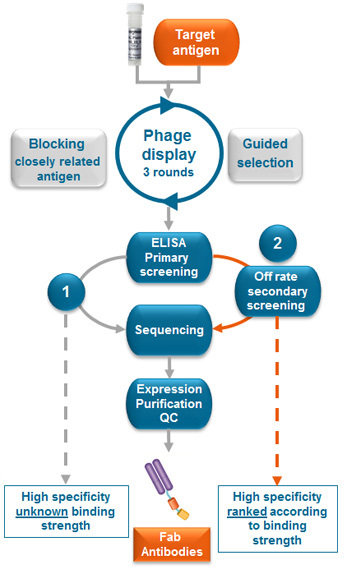 After enrichment of antigen-specific antibodies via phage display, the selected antibodies are analyzed for specificity in an ELISA-based primary screening. In a standard antibody screening process (left side of figure), 20 antibody clones are randomly selected based upon their specificity as evaluated in ELISA. In an extended antibody screening process (right side of figure), 95 ELISA-positive antibody clones, derived from the primary screening, are ranked according to their binding strength (koff-rate determination; ‘secondary screening’). 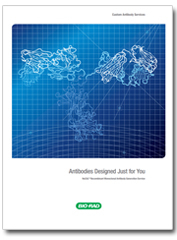 Selection of antibodies can now occur according to both antigen specificity and also binding strength. Both antibody screening tracks offer unique monoclonal antibodies of high specificity, but only the extended antibody generation process offers the additional benefit of selecting antibodies based upon their binding strength.